This is a sponsored post written by me on behalf of Nutrimom for IZEA. All opinions are 100% mine. Over the past several months I've been partnering with Nutrimom for Personal Coaching to help change some of my personal wellness habits along with working to make my family more healthy! My new baby's lifelong wellness will be positively shaped by the nutrition and environment I provide, so creating a healthier environment in our home before the baby is born is essential. 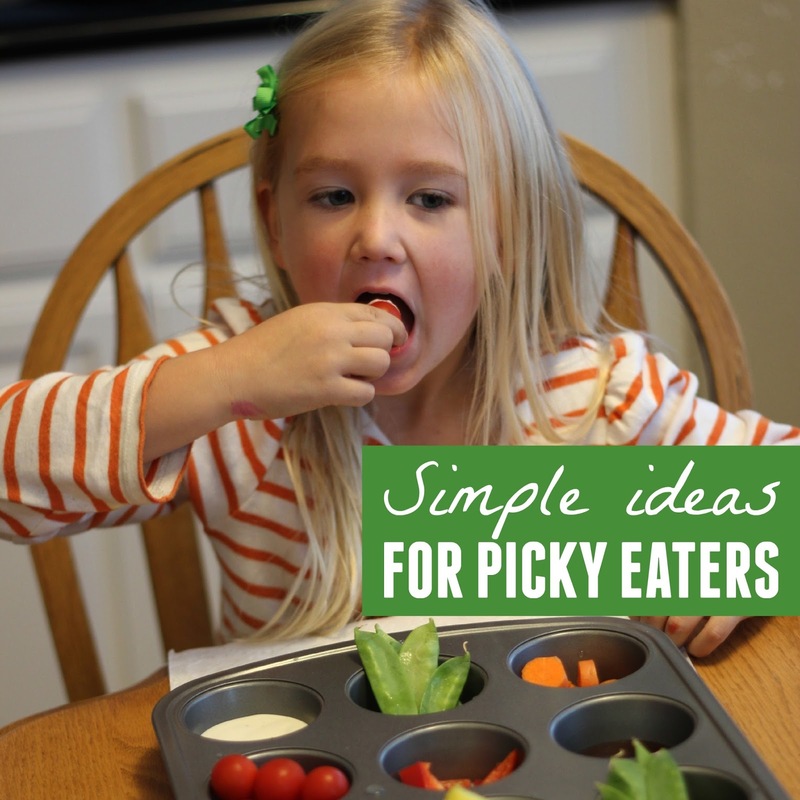 Today I am going to share a few tips from my Nutrimom coach (Annie) that can help picky eaters expand their food repertoire a bit. I am also going to share a bit about the Nutrimom subscription box that I got to try out recently. Toddlers are notorious for being picky eaters. Often toddlers are exerting their independence and control and mealtime becomes a power struggle. A few years ago we decided to stop making mealtime a power struggle and instead we decided to embed more choice into mealtime and offer more control to our kids. We decided that it was our job to make healthy meals and offer them... but it was up to the kids to actually eat them. No bribing or forcing them. If they don't eat what is offered, then they don't eat for that meal. This plan doesn't work with kids who have severe health issues around food, but worked with our kids who tend to be just plain picky! In addition to giving the choices/control back to my kids... we've also been trying two different ideas shared by my Nutrimom coach to help make mealtimes more interesting (and less stressful) and get my kids to try more varied foods (especially vegetables). One of the best ways to help kids try new food is through the use of dips! My Nutrimom coach Annie recommended that we pair unknown (or disliked) foods with known foods that our kids like. This is called food chaining. One recommendation she had to help ease the pressure off of my kids was to try doing a tasting tray at mealtime including dips. 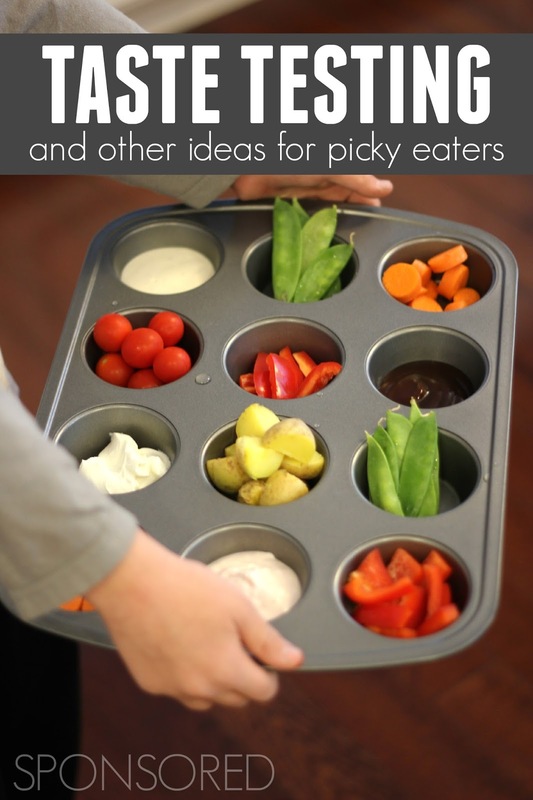 To create a tasting tray we put several vegetables (or other foods) that my kids didn't like in each spot of the muffin tin liner. We also included some familiar veggies that they DO like. I cut up the vegetables and spread them around. We also added different dips that the kids liked in the muffin tin holes. Instead of forcing the kids to try things we set up the tasting tray experience guidelines where the kids and grown ups needed to taste each item to help rate it for our food rating poster. We talked about food characteristics like whether things were crunchy or slimey to help take the pressure off the tasting experience. The kids weren't required to try anything, but they were encouraged to try at least one bite of everything! I made sure to give a lot of praise to the kids when they tried new things. The dips we tried included greek yogurt, sour cream, and BBQ sauce. It was shocking to me what items the kids were willing to eat solely due to the familiar dip that was there. My toddler dipped everything in BBQ and my preschooler dipped everything in greek yogurt! While we tried different foods each child got a different colored marker and could use it to rate whether they liked a vegetable or not on our poster. My oldest is typically anti anything new and is super picky and he was willing to try out several of the new-to-him vegetables without a fuss. By making the activity more about the textures of the food and giving kids choice, I found that pressure dissolved quite a bit. Another meal idea that my Nutrimom coach suggested is offer more deconstructed meal options for mealtime. Deconstructed meals involve serving dinner family style and each family member gets to pick what items they want to put on their plate and eat. Typically kids will serve themselves more healthy food when it is shared family dinner style and select more of a variety of foods when they are given the choice than when they are required to try them. When we do deconstructed meals we make sure to include something at each meal that everyone is capable of eating. As we serve deconstructed meals we like to stick with the reminder that we can't make anyone do anything AND kids make increasingly better choices (most of the time) when you give them the power to choose along with a good example to follow (you as a parent!). Using the muffin tin taste testing and deconstructed meal ideas have really helped our kids at dinner time. I have really appreciated the weekly phone sessions with my Nutrimom coach to give me ideas to help me and my family be healthier. The Nutrimom Program provides so many great things including one-on-one sessions with your personal Nutrimom Coach, ongoing messaging with the team of Early Life Nutrition experts, webinars, group coaching sessions on topics from lactation to physical activity, and help with setting and tracking goals. The Nutrimom program also offers a specialized line of nutrition products to help ensure you’re getting the nutrients you need at every stage of your baby’s development. Using the products and dietary supplements, along with a healthy diet, can be really helpful to moms and moms-to-be throughout the first 1,000 days of baby’s development. This month I had the opportunity to review a Nutrimom subscription box. Each product was formulated for my baby's stage of development. I am currently around 32 weeks pregnant, so the box contained several items for my current stage. I loved the personalized note in my box! Prenatal dietary supplements (these are helpful for making sure I get key vitamins and minerals to support my special nutritional needs as a pregnant women). I take these each night before bed. Apricot and cashew bars, super fruit bars, and lemon ginger bars which contain B-Complex to support physical energy and vitamin D to support bone health. The lemon ginger bar also helps if you have morning sickness, which fortunately I haven't had. The bars were packed with a lot of nutrients to help ensure that I get the nutrients I need as a pregnant mom! The bars and prenatal supplements complimented the online coaching I received and provided additional options to help me maintain the utmost health. Often grabbing a nutrition bar is a quicker way to infuse vitamins into my diet than carefully planning out specific meals and trying to find time to make them. My favorite nutrition bar was the super fruit bar because I love cranberries and dried blueberries. In addition to the online coaching and subscription box, I have loved the large digital library of easily searchable, science-based nutrition and wellness information that is available to me through my Nutrimom membership! I can quickly search using my desktop or the app on my phone and find loads of helpful resources. I have loved trying out the Nutrimom program over the last few months. Having someone on my "team" to offer suggestions to make my health a priority and then helping give me guidance to help my family has been invaluable! For those interested in signing up for the Nutrimom program for Personal Coaching or learning more about the Supplements offered, you can view all the different subscription plans here. You can also check out my favorite Healthy Mini-Meals for busy moms HERE. This post is sponsored by Nutrimom but all opinions are mine! Thanks Nutrimom for making the past several months much healthier and happier with regards to food at our house!